The SASI ladies hope that everyone has a joyful holiday season! Coming to Austin next month for SXSW? Join SASI and SocialChorus on Saturday, March 8, 3-5pm for an afternoon of networking, drinks and a conversation about employee advocates, featuring innovative marketers from AT&T, Whole Foods and RadioShack. Listening and connecting with customers across social media has always been part of Dell’s business and heritage, but Bryan’s vision is to formalize this into performance plans and create the first fully digitally connected, socially enabled marketing organization inside Dell. Why? Bryan believes that social media is critical to Dell’s competitive advantage, and is a critical skill set for his organization; he is staffing, training, rewarding and creating a cultural shift for adoption, innovation and a new way of operating. During Q&A at socialmedia.org’s #BrandsOnly summit, an audience member asked me, “What was your biggest lesson learned launching Dell’s social media training program?” My answer was simple. You must attain Executive support for launching a social media training and employee advocacy program, especially the middle management layer. 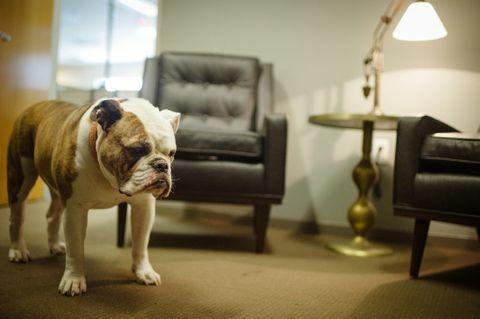 Even if you think you have senior buy-in, ensure that middle management understands the value of social media and how to effectively lead (and manage) in the space. Why? Middle management is the lynch pin for the success or failure of all the hard work, sweat, blood and tears that you have placed into your social media training and advocacy programs. You are trying to motivate and change behavior for individual employees. The majority of employees look to their direct management team for support and buy-in when it comes to their daily work. SASI wishes you all a wonderful holiday filled with lots of laughter, family and friends! Looking for gift ideas for your favorite employee advocates? 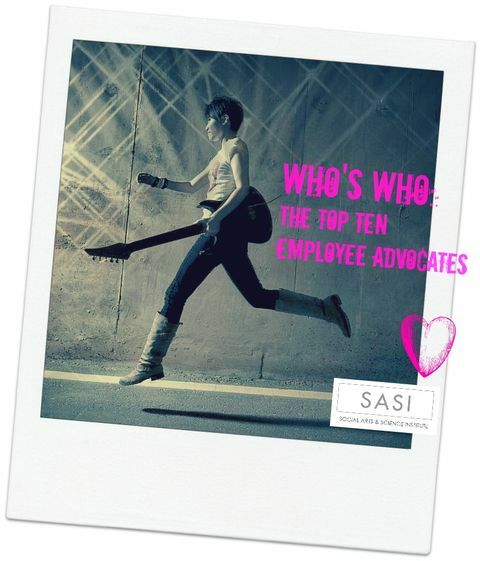 SASI has you covered, with some super sassy social surprises. 4. Get together and celebrate the holiday season with your social employees at a Tweetup party. Interested in building out a training program to empower your employees on social media? Liz Bullock had the opportunity to share her top ten tips on this topic at SocialMedia.org #BrandsOnly Summit. Below are a few of my favorites. #1. Incredible and forward thinking clients, wanting to socially enable their workforce to make a business impact and closer customer relationships. #2. Patient clients willing to delay our initial meeting, as I drove to a Mexican restaurant in Park City vs. their corporate headquarters in Salt Lake City. #3. To an incredible partner who constantly shares diverse opportunities, even the idea of a bus tour! Stay tuned for SASI bus tour 2014! #5. For our clients and partners who appreciate our quirky sense of humor, random nicknames and ability to bring fun into the work environment. 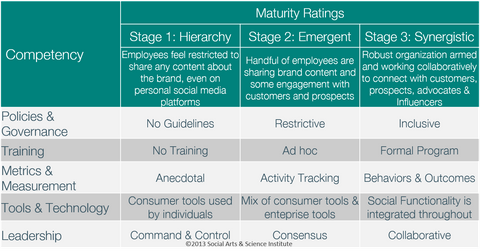 Employees are your key ingredient in the new social era. 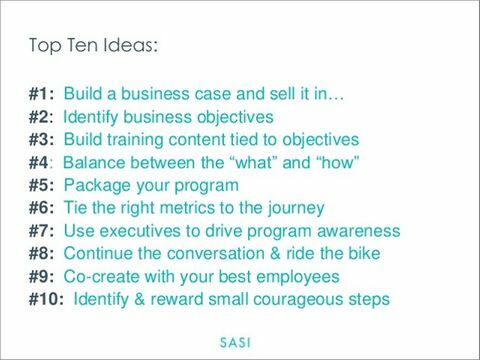 Last week, SASI CEO Liz Bullock participated in a webinar with SocialChorus CEO Greg Shove on how brands can empower their employees to become advocates. Liz shared case studies on innovative companies that have tapped into the enormous potential that already lies within the walls of their own businesses. · Have 10x more followers than the Cisco corporate accounts. · Share 29% more links about the company than the corporate accounts. · Reach 2x more people than the corporate accounts. Watch the webinar, or view the slideshow for more great advice on how and why to empower your employees. Is your company ready for an employee advocacy program? Employee Advocacy has become the new trend this season. Where past social media conferences focused on Facebook and Twitter, this season’s agendas are filled with discussing employees advocacy programs and employee advocacy software tools. Simply put, employees are a powerful and authentic resource to help scale your social business. Companies like Intel, Dell, Cisco, Sprint and others are seeing powerful results by activating social employees on behalf of the brand. What is required to launch an employee advocacy program?